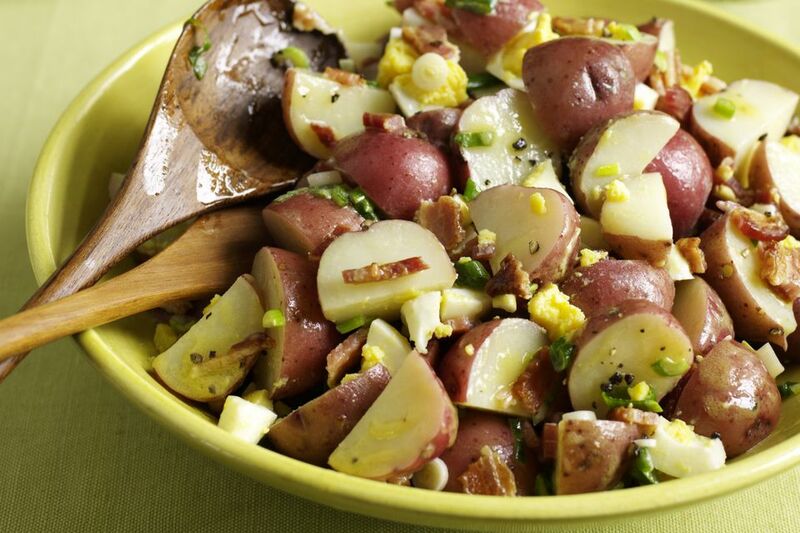 This German potato salad is made with a tangy, sweet and sour bacon and egg dressing, and includes chopped green pepper and onion. Garnish the salad with hard-cooked eggs and some chopped green onion or parsley. Cook the potatoes in a covered saucepan in boiling salted water until tender, about 15 to 20 minutes. Drain well and set aside. In a large skillet, saute the diced bacon until almost crisp. Add the onion and green bell pepper; cook for 3 minutes longer. In a bowl, combine beaten eggs with vinegar, sugar, and pepper; whisk to blend well. Gradually add egg mixture to the bacon and vegetables, stirring and cooking until mixture thickens. Remove from heat and toss gently with potatoes. Spoon the salad into a serving dish and garnish with sliced hard-boiled eggs and chopped green onion tops or parsley. *Use red potatoes, round whites, or Yukon gold potatoes. Unpeeled red potatoes or new potatoes make a beautiful salad, but peel them if you prefer. Makes about 6 to 8 side dish servings.